Getting back to this month’s theme of Eat Right…With Color – make a goal today to try an orange food for a change. Orange fruits and vegetables contain phytochemicals and nutrients such as vitamin A, lutein and lycopene. The 2010 Dietary Guidelines encourages people to eat the recommended amount of vegetables, in particular dark greens and red/orange vegetables. Sweet potatoes – swap these for regular potatoes. Alexia makes delicious all-natural sweet potato fries (baked) if the only potatoes that cross your lips tend to be in matchstick form. Butternut squash – this winter veggie is hardy and makes a delicious soup. My favorite is Campbell’s V8 soup which has just the right amount of texture and flavor. I also make my own homemade butternut squash soup with onions, a granny smith apple, honey and olive oil (thank you for the recipe, mother-in-law! ), but it’s time consuming, a little messy, and gobbled up in no time! Pumpkin – this veggie deserves attention not just at Halloween. 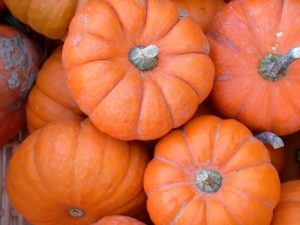 Canned pumpkin puree is available all year round and makes a great ingredient in baked dishes, such as pumpkin bread. My sister also makes delicious pumpkin “donuts” that fit within her kids’ school wellness policy for classroom potlucks. Orange bell peppers – sweeter than green bell peppers, which I find a little too strong sometimes, these look gorgeous on any salad, and the mini peppers can be eaten whole as a snack. wow – honored to get a mention!